IN THE OLDEN DAYS, when the tigers still lived in peace with other animals, the crow was called "The Bird of Paradise." Her feathers were of purest white; but since then she has lost these beautiful white feathers and in their place wears black ones. When Allah had shaped the fishes, the birds, and the four-footed beasts, he called the white crow to him and said, "Bird of Paradise, you are large and handsome, you are strong and swift; therefore you shall be my messenger." The crow bowed her sleek white head and said, "Great Allah, I will be your messenger. Tell me what you wish me to do. Allah showed the white crow a bit of clay, and said, "From this clay I am going to knead a man." So Allah kneaded a man, and when he had laid the figure near him on the ground he called the animals to admire it. All of them came the birds, the four-footed beasts, and the fishes. All of them looked on the man made of clay that lay motionless on the ground. And when Allah asked, "Well, how do you like this man?" the fishes began by saying, "It's a very, very strange thing!" "Is that a man?' cried the birds in amazement. "It's nothing but a piece of clay!" "Yes, that's all it is just a piece of clay!" the four-footed beasts cried, too. "And you, my messenger, what do you think of this man?" Allah asked the white crow. "I say that it has a wonderful shape," answered the crow, "but . . ."
"What else do you want to say?" asked Allah. "Only this: there is no life in the man," the crow said at last. "There shall indeed be life in the man," Allah said then. "And I not only wish to give him life, I want to make him immortal. Therefore I am sending you, my messenger, this very day to bring me the life-water from the fountain of life, that shall make man immortal." "And in what shall I fetch the water?" asked the white crow. "Will one beak-full be enough to make the man immortal?" "No," Allah replied. "You must fetch the water in the big vessel that you will find beside the fountain of life. And remember this: do not let any other animal drink of the water, because I want man alone to be immortal. Promise me that you will not drink any of it, either." "I promise," said the white crow, and she flew away to fetch the life-giving water. The fountain of life was far away, and the white crow became tired and thirsty. After she filled the vessel and had flown part of the way back, she had a great desire to drink just a few drops of the water. "Allah will never be able to see that there are a few drops missing," she reasoned to herself. "And why shouldn't I slake my thirst with the water? Then I shall be immortal, too." So thought the white crow. And the more she thought about it, the more she longed for immortality. Finally she drank a few drops . . . and then a few more . . . and, at last, she had almost emptied the vessel. "Is that the vessel full of life-water that you were to bring me?" asked Allah, when he saw the few drops that still remained in it. "With these few drops I can give man life, but I cannot make him immortal. Why were you unable to fill the vessel, my messenger?" "There was no more life-water in the fountain/' lied the white crow. When Allah heard this, he was so angry at the white crow that he took her beautiful white feathers from her and in place of them gave her black ones. And when the black-feathered crow stood before him with her head bowed in shame, Allah spoke to her and to the magpie, "I expel you both from Paradise. You, crow, because you drank the life-water and then lied about it. And you, magpie, because you were a spy and a talebearer, I will take away half of your white feathers and, even as the crow, you shall have black ones in their place!" 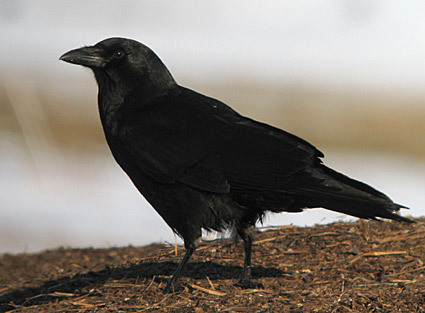 That is why the magpie has black-and-white feathers, and the crow is entirely black. But whether or not the life-water made the crow immortal the story does not tell.